A primary school unwittingly illustrated its newsletter with a picture of a "rude" Christmas jumper. The notice, sent to pupils at Hyde Park Junior School in Plymouth, carried a photo of a festive sweater emblazoned with what looked like rutting reindeer. Children were invited to "jazz up their uniform" with the yuletide attire, according to the Plymouth Herald. Head teacher Tina Jackson apologised for any offence caused, and admitted staff "didn't look closely enough". 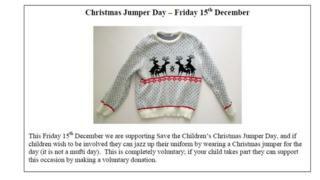 The newsletter was intended to alert pupils to Christmas Jumper Day in aid of Save the Children. Miss Jackson added: "We're sorry if it has offended anyone and hope it doesn't spoil our good intention of encouraging pupils to support a very worthy cause."